A comparison bake looking at two different folding in methods when making cake batters. It’s been some time since I last shared a Side-by-Side bake, so wanting to remedy that I donned my pinny and gathered my taste testers together. the ease of a technique. 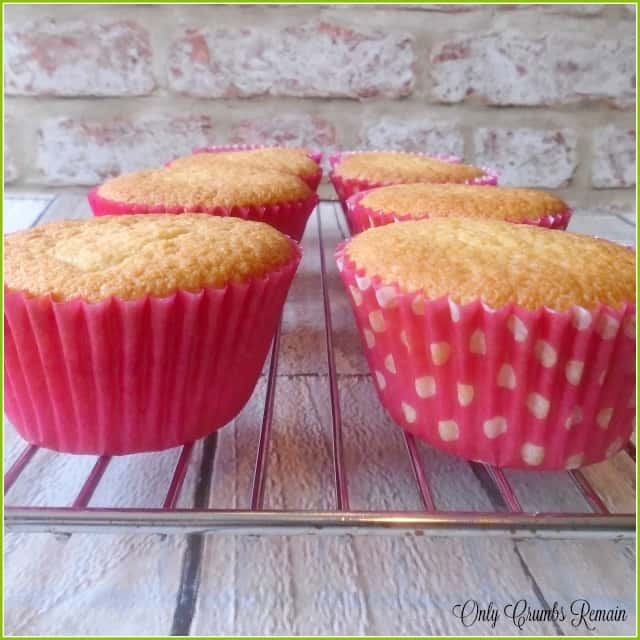 So far we have compared gluten free flour against regular self raising flour in cupcakes; the creaming-in method against the all in one method when making sponges; the effects of resting yorkshire pudding batters; two different pikelet recipes; three different methods of infusing tea flavour into a sponge batter; and the impact butter quality has on sponge bakes. All of this couldn’t be done without my small group of ‘volunteer’ taste tasters who are briefed on the nature of each comparison bake before trying the samples. This particular Side-by-Side comparison looks at two different methods of folding flour into a cupcake batter. It was inspired by August’s edition of Asda’s free magazine, ‘Good Living‘, which I picked up during a recent shop. As you may know, James Martin is the new face of Asda, helping them to promote good family food and straightforward bakes. In the magazine are numerous recipes and tips shared by the Yorkshire pro-chef himself. 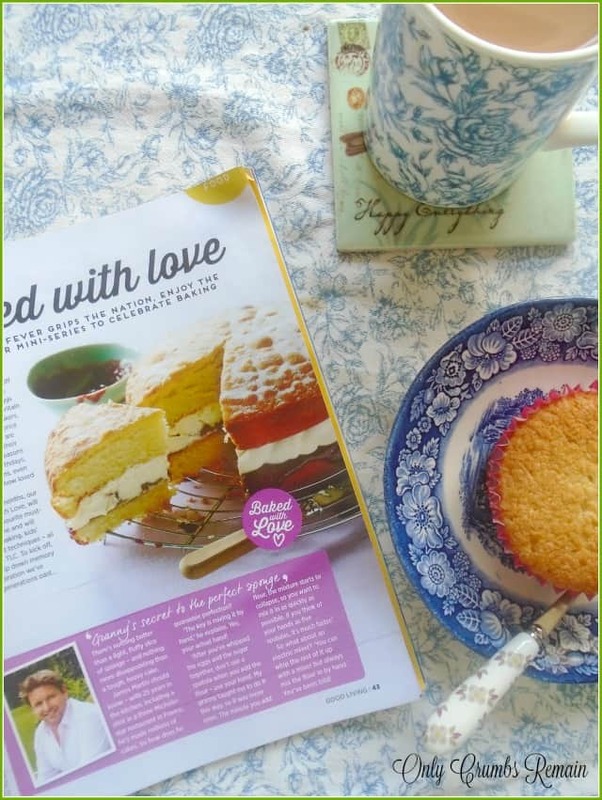 One of those tips is on page 43 of the August magazine, where James shares ‘Granny’s secret to the perfect sponge‘. He explains that the secret to a great, fluffy, light, sponge is by combining the flour into the beaten egg and sugar mixture by hand. Literally by hand, so no need to dig out any fancy kitchen gadgets! He goes onto say that “the minute you add the flour, the mixture starts to collapse, so you want to mix it as quickly as possible. If you think of your hands as five spatulas, it’s much faster“. Although I’ve often seen pro pastry chefs use their hands rather than kitchen gadgets, I personally have never tried this particular technique (well, I’m not a pro-chef, just a keen home baker 🙂 ). So, being a huge fan of James Martin’s baking I decided to give it a go, and what better idea than to compare it against a sponge using the folding technique I usually adopt. In recent years I’ve tended to favour using a spatula to fold our flour into a batter, though as a youngster I was taught to use a metal spoon. Side-by-side baking, comparing two techniques of folding in flour. with the flour folded in with a spatula and the other folded in by hand. How I went about the Side by Side baking comparison. of time. 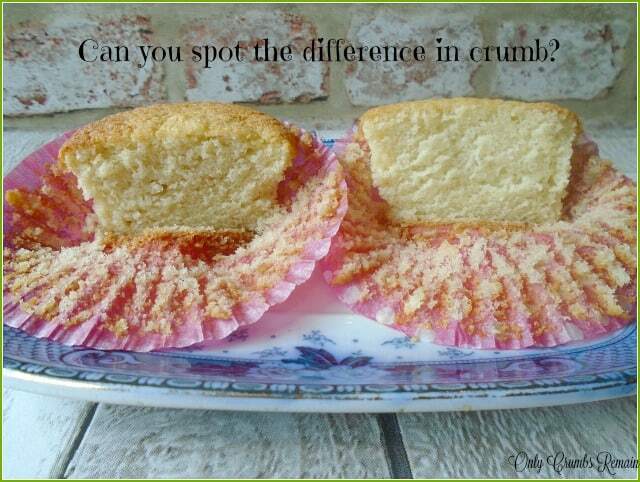 Different patterned paper cases were used for the two different bakes, thus preventing them from being muddled up. Comments about folding in by hand. Given that James Martin encouraged us to think of our hand as being five spatulas, I splayed my fingers during the folding and mixing process rather than keeping my fingers together to create just one utensil. Although it didn’t occur to me to time the actual folding-in process in both of the batters, this method certainly did seem to be quicker which surely is a good thing. Not only would the batter retain more air but the gluten in the flour (unless you’re using a gluten free flour of course) isn’t being activated helping to create a lighter bake. This method also allowed me to ‘feel’ when the consistency of the batter was ready, rather than judging it through a plasic or metal utensil. The slight negative point to this mixing process is the obvious messy nature, but given that the folding-in literally only takes 10-15 seconds your hand can soon be washed leaving them pristine again. the tasters to prevent them from being unintentially influenced, so my tasters sampled them blind, so to speak. Only I knew which cupcake was which. How do you fold your flour into your cake batter? Have you ever tried hand folding? 1. Pre-heat the oven to 190c / Fan 170c / Gas 5. Place the muffin sized cases into the muffin tray. 2. Make the sponge. Place the soft butter and sugars into a good sized bowl and beat together with a wooden spoon or electric beaters until very pale and fluffy. Gradually add the beaten egg a little at a time, beating well after each addition. Beat in the milk. Sieve the flour into the mixture. Use a spatula, large metal spoon or your hand with your fingers splayed to fold this in gently. 3. Fill the muffin cases. Using a teaspoon, fill the cases with the batter mixture. You’re aiming for them to be half to two-thirds full. You may decide to weigh each muffin to ensure equal sizes. Each will weigh about 62g. This was such an interesting read! I honestly didn't expect the textures to look so different. I know a couple of eldery ladies who swear by using their hands to mix christmas/fruit cake batters and Paul Hollywood is certainly always keen to stick his hand into mixtures, but I had never considered to apply it to the humble victoria sponge. I'll have to try this out! Another fascinating comparison Angela, I always look forward to reading these posts. I've never read a recipe where the flour had been mixed in by hand before, always folded or beaten, I was surprised at the difference it seems to make to the crumb in the picture. I'd definitely be tempted to give it a go in future. Nor have I Charlotte, though I do seem to think that I've seen one or two pastry chefs fold it in on TV (though it's entirely possible that I've dreamed it!). Until I read James Martin's piece in the magazine I honestly didn't fancy the idea of it. Although there is a difference between the cakes in the images, to be honest I think it seemed more noticeable to the naked eye. Thanks for your lovely comment Charlotte, and I'd love to hear how you get on with it if you give the method a try. Aw thank you Mandy 🙂 I think it's deinitely worth getting the hands a little bit messy especially if you're making a special bake. I'd love to hear how you get on with it. Wow! 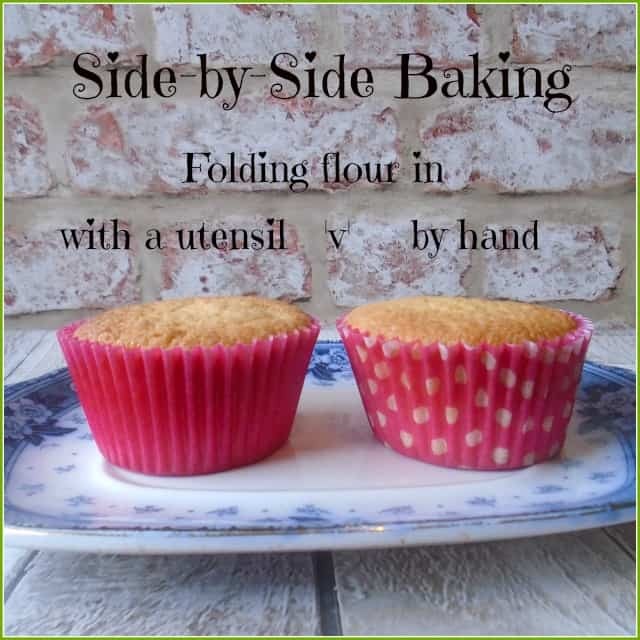 I've never even thought of hand folding, but I love getting a bit messy whilst baking so I'll give it a try soon and let you know how I get on! Well this is a new one for me. Ive never heard of it or know anyone who does it. I do not tend to shy away from getting stuck in with my hands. I feel that very often your hands are cleaner than utensils given the number of time i wash them during any one cooking session. Also sometimes you need to use your hands to gage if a mixture "feels" correct. That said Im really not sure i would want to in this case – Do you not waste rather a lot with it sticking to your hands which must surely be a larger area than a spatula. Still you have intrigued me enough to think maybe I should at least try it. I think I've seen a couple of pro chefs mix by hand on TV programmes, the person who comes to mind is Paul Hollywood and I wasn't totally enthrawled by the idea – it just looked so messy. But since reading James Martin's piece and recognising how it is a much faster process (with 5 'spatulas' rather than 1) I thought I'd give it a whirl. My instinct too was that it would waste a lot of batter (I'm sorry, I forgot to discuss it in the post), but having knocked off a large amount of batter from my hands I ended up with the same number of cupcakes as I did when I made those with the regular spatula. If you give it a try I'd love to hear how you get on with it. Thank you Jenny, We both learnt something new there. It really made sense when in my mind when I read his short piece about it but yet I was still surprised to see the difference in crumb when I cut the cakes in half. I'm imagining it could be a more marked difference if the technique was used in a fat-free sponge. What a great post. I often talk about how technique is just as important as the ingredients in a baked good. Nice work! Isn't it just. As soon as I read it in the magazing i thought, "Oh, yeah, that makes sense"! And it really did fold in a lot quicker than with the spatula. I'm sure it'd work with a vegan sponge too Midge, I'd love to hear how you get on.